The outdoor stairlifts supplied by Budget Stairlifts are now considered as one of the most technologically advanced stairlifts in the world today. All our outdoor stairlifts now come with all of the safety and comfort features expected from our indoor stairlift models, but are built to work and last in outdoor environments. Ideal for garden steps, sun decks, porches, front stoops and garages or basement steps. All metallic components are aluminium, oil annealed or zinc plated, preventing rusting. Components are designed to withstand salt-intense air, making them ideal for use within range of beaches. A number of "exposed" components are plastic to prevent sun/rain damage. 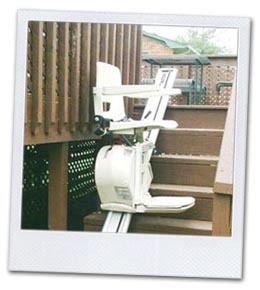 Includes a durable plastic to keep leaves and snow from settling on the stairlift.